As you probably already know, Wikipedia is a website. A website has content—the articles; and it has user interface—the menus around the articles and the various screens that let editors edit the articles and communicate to each other. Another thing that you probably already know is that Wikipedia is massively multilingual, so both the content and the user interface must be translated. Translation of articles is a topic for another post. This post is about getting all of the user interface translated to your language, as quickly and efficiently as possible. The most important piece of software that powers Wikipedia and its sister projects is called MediaWiki. As of today, there are 3,335 messages to translate in MediaWiki, and the number grows frequently. “Messages” in the MediaWiki jargon are strings that are shown in the user interface, and that can be translated. In addition to core MediaWiki, Wikipedia also has dozens of MediaWiki extensions installed, some of them very important—extensions for displaying citations and mathematical formulas, uploading files, receiving notifications, mobile browsing, different editing environments, etc. There are around 3,500 messages to translate in the main extensions, and over 10,000 messages to translate if you want to have all the extensions translated. There are also the Wikipedia mobile apps and additional tools for making automated edits (bots) and monitoring vandalism, with several hundreds of messages each. Translating all of it probably sounds like an enormous job, and yes, it takes time, but it’s doable. In February 2011 or so—sorry, I don’t remember the exact date—I completed the translation into Hebrew of all of the messages that are needed for Wikipedia and projects related to it. All. The total, complete, no-excuses, premium Wikipedia experience, in Hebrew. Every single part of the MediaWiki software, extensions and additional tools was translated to Hebrew, and if you were a Hebrew speaker, you didn’t need to know a single English word to use it. I wasn’t the only one who did this of course. There were plenty of other people who did this before I joined the effort, and plenty of others who helped along the way: Rotem Dan, Ofra Hod, Yaron Shahrabani, Rotem Liss, Or Shapiro, Shani Evenshtein, Inkbug (whose real name I don’t know), and many others. But back then in 2011 it was I who made a conscious effort to get to 100%. It took me quite a few weeks, but I made it. Of course, the software that powers Wikipedia changes every single day. So the day after the translations statistics got to 100%, they went down to 99%, because new messages to translate were added. But there were just a few of them, and it took me a few minutes to translate them and get back to 100%. I’ve been doing this almost every day since then, keeping Hebrew at 100%. Sometimes it slips because I am traveling or I am ill. It slipped for quite a few months because in late 2014 I became a father, and a lot of new messages happened to be added at the same time, but Hebrew is back at 100% now. And I keep doing this. With the sincere hope that this will be useful for translating the software behind Wikipedia to your language, let me tell you how. First, let’s do some work to set you up. Get a translatewiki.net account if you haven’t already. Make sure you know your language code. Go to your preferences, to the Editing tab, and add languages that you know to Assistant languages. For example, if you speak one of the native languages of South America like Aymara (ay) or Quechua (qu), then you probably also know Spanish (es) or Portuguese (pt), and if you speak one of the languages of the former Soviet Union like Tatar (tt) or Azerbaijani (az), then you probably also know Russian (ru). When available, translations to these languages will be shown in addition to English. Familiarize yourself with the Support page and with the general localization guidelines for MediaWiki. Add yourself to the portal for your language. The page name is Portal:Xyz, where Xyz is your language code. The translatewiki.net website hosts many projects to translate beyond stuff related to Wikipedia. It hosts such respectable Free Software projects as OpenStreetMap, Etherpad, MathJax, Blockly, and others. Also, not all the MediaWiki extensions are used on Wikimedia projects; there are plenty of extensions, with thousands of translatable messages, that are not used by Wikimedia, but only on other sites, but they use translatewiki.net as the platform for translation of their user interface. It would be nice to translate all of it, but because I don’t have time for that, I have to prioritize. Intuition: a set of different tools, like edit counters, statistics collectors, etc. Pywikibot: a library for writing bots—scripts that make useful automatic edits to MediaWiki sites. I usually don’t work on translating other projects unless all of the above projects are 100% translated to Hebrew. I occasionally make an exception for OpenStreetMap or Etherpad, but only if there’s little to translate there and the untranslated MediaWiki-related projects are not very important. So how can you know what is important among more than 15,000 messages from the Wikimedia universe? Start from MediaWiki most important messages. 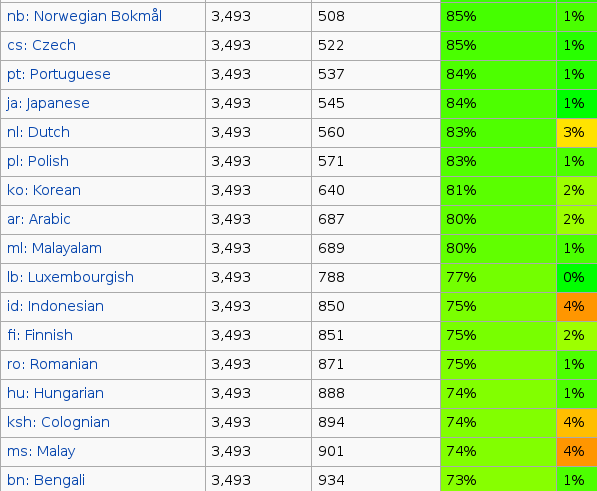 If your language is not at 100% in this list, it absolutely must be. This list is automatically created periodically by counting which 600 or so messages are actually shown most frequently to Wikipedia users. This list includes messages from MediaWiki core and a bunch of extensions, so when you’re done with it, you’ll see that the statistics for several groups improved by themselves. Now, if the translation of MediaWiki core to your language is not yet at 18%, get it there. Why 18%? Because that’s the threshold for exporting your language to the source code. This is essential for making it possible to use your language in your Wikipedia (or Incubator). It will be quite easy to find short and simple messages to translate (of course, you still have to do it carefully and correctly). Once you have the most important MediaWiki messages 100% and at least 18% of MediaWiki core is translated to your language, where do you go next? You need to get everything to 100% eventually. There are several ways to get there. Your mileage may vary, but I’m going to suggest the way that worked for me: Complete the easiest piece that will get your language closer to 100%! For me this is an easy way to strike an item off my list and feel that I accomplished something. MediaWiki core: the base MediaWiki software itself! I put MediaWiki core last intentionally. It’s a very large message group, with over 3000 messages. It’s hard to get it completed quickly, and to be honest, some of its features are not seen very frequently by users who aren’t site administrators or very advanced editors. By all means, do complete it, try to do it as early as possible, and get your friends to help you, but it’s also OK if it takes some time. OK, so if you translate all the items above, you’ll make Wikipedia in your language mostly usable for most readers and editors. Let’s go further not just for the sake of seeing pure 100% in the statistics everywhere. There’s more. As I wrote above, the software changes every single day. So do the translatable messages. You need to get your language to 100% not just once; you need to keep doing it continuously. Once you make the effort of getting to 100%, it will be much easier to keep it there. This means translating some things that are used rarely (but used nevertheless; otherwise they’d be removed). This means investing a few more days or weeks into translating-translating-translating. You’ll be able to congratulate yourself not only upon the big accomplishment of getting everything to 100%, but also upon the accomplishments along the way. One strategy to accomplish this is translating extension by extension. This means, going to your translatewiki.net language statistics: here’s an example with Albanian, but choose your own language. Click “expand” on MediaWiki, then again “expand” on “MediaWiki Extensions”, then on “Extensions used by Wikimedia” and finally, on “Extensions used by Wikimedia – Main”. Similarly to what I described above, find the smaller extensions first and translate them. Once you’re done with all the Main extensions, do all the extensions used by Wikimedia. (Going to all extensions, beyond Extensions used by Wikimedia, helps users of these extensions, but doesn’t help Wikipedia very much.) This strategy can work well if you have several people translating to your language, because it’s easy to divide work by topic. Another strategy is quiet and friendly competition with other languages. Open the statistics for Extensions Used by Wikimedia – Main and sort the table by the “Completion” column. Find your language. Now translate as many messages as needed to pass the language above you in the list. Then translate as many messages as needed to pass the next language above you in the list. Repeat until you get to 100%. Let’s say that you are translating to Malay. You only need to translate eight messages to go up a notch (901 – 894 + 1). Then six messages more to go up another notch (894 – 888). And so on. Once you’re done, you will have translated over 3,400 messages, but it’s much easier to do it in small steps. Once you get to 100% in the main extensions, do the same with all the Extensions Used by Wikimedia. It’s over 10,000 messages, but the same strategies work. Never assume that the English message is perfect. Never. Do what you can to improve the English messages. Developers are people just like you are. They may know their code very well, but they may not be the most brilliant writers. And though some messages are written by professional user experience designers, many are written by the developers themselves. Developers are developers; they are not necessarily very good writers or designers, and the messages that they write in English may not be perfect. Keep in mind that many, many MediaWiki developers are not native English speakers; a lot of them are from Russia, Netherlands, India, Spain, Germany, Norway, China, France and many other countries, and English is foreign to them, and they may make mistakes. Another good thing is to do your best to try running the software that you are translating. If there are thousands of messages that are not translated to your language, then chances are that it’s already deployed in Wikipedia and you can try it. Actually trying to use it will help you translate it better. Whenever relevant, fix the documentation displayed near the translation area. Strange as it may sound, it is possible that you understand the message better than the developer who wrote it! Before translating a component, review the messages that were already translated. To do this, click the “All” tab at the top of the translation area. It’s useful for learning the current terminology, and you can also improve them and make them more consistent. After you gain some experience, create a localization guide in your language. There are very few of them at the moment, and there should be more. Here’s the localization guide for French, for example. Create your own with the title “Localisation guidelines/xyz” where “xyz” is your language code. As in Wikipedia, Be Bold. OK, So I Got to 100%, What Now? Now check the statistics for your language every day. I can’t emphasize how important it is to do this every day. The way I do this is having a list of links on my translatewiki.net user page. I click them every day, and if there’s anything new to translate, I immediately translate it. Usually there is just a small number of new messages to translate; I didn’t measure precisely, but usually it’s less than 20. Quite often you won’t have to translate from scratch, but to update the translation of a message that changed in English, which is usually even faster. But what if you suddenly see 200 new messages to translate? It happens occasionally. Maybe several times a year, when a major new feature is added or an existing feature is changed. Basically, handle it the same way you got to 100% before: step by step, part by part, day by day, week by week, notch by notch, and get back to 100%. But you can also try to anticipate it. Follow the discussions about new features, check out new extensions that appear before they are added to the Extensions Used by Wikimedia group, consider translating them when you have a few spare minutes. At the worst case, they will never be used by Wikimedia, but they may be used by somebody else who speaks your language, and your translations will definitely feed the translation memory database that helps you and other people translate more efficiently and easily. Consider also translating other useful projects: OpenStreetMap, Etherpad, Blockly, Encyclopedia of Life, etc. Up to you. The same techniques apply everywhere. What Do I Get for Doing All This Work? The knowledge that thanks to you people who read in your language can use Wikipedia without having to learn English. Awesome, isn’t it? Some people call it “Good karma”. Oh, and enormous experience with software localization, which is a rather useful job skill these days. Is There Any Other Way in Which I Can Help? If you find this post useful, please translate it to other languages and publish it in your blog. No copyright restrictions, public domain (but it would be nice if you credit me and send me a link to your translation). Make any adaptations you need for your language. It took me years of experience to learn all of this, and it took me about four hours to write it. Translating it will take you much less than four hours, and it will help people be more efficient translators. I’m deeply grateful to all the people who made these translations; keep them coming!